Begin with the annual colorful costumed parade, Europe’s largest Regency costumed Promenade. Jane Austen set two of her novels in Bath, Northanger Abbey and Persuasion, and made the city her home from 1801 to 1806. Every year in September there is a festival that celebrates Jane Austen and all things Regency. This year’s tenth Jane Austen Festival, held from September 17th to the 25th, will begin with the annual colourful costumed parade, Europe’s largest Regency costumed Promenade where a multitude of people will be parading along the grand Georgian terraces of 18th century Bath in period costumes. In addition, the week long program includes talks and productions, readings and tours, and draws Jane Austen fans from around the world. 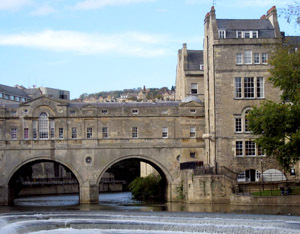 For Jane Austen fans, there is plenty to explore in Bath. The Jane Austen Centre on Gay Street, which celebrates Bath’s most famous resident, offers a snapshot of life during Regency times and explores how living in Bath affected Jane Austen’s life and writing. There is also a traditional tea room above the museum – the Regency Tea Rooms – that serves a variety of teas, cakes, lunches and light snacks. Moreover, The Jane Austen Centre runs walking tours which show where Jane Austen lived and places that were used in her novels. For further information about this year’s festival, see the major festival and events listing page on visitbath.co.uk.